Here are all the information regarding the plot and cast for Kamen Rider Ghost The Movie: The 100 Eyecons & Ghost's fated moment. "After chasing the mysterious Kamen Rider Dark Ghost, who had suddenly appeared, Takeru arrives at a strange village full of historical figures. 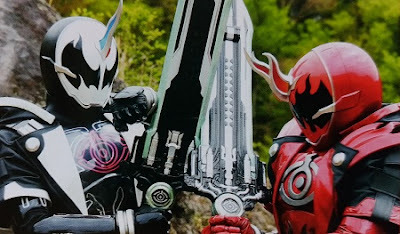 Attempting to gather 100 Eyecons, Alain’s dead brother Argus - Kamen Rider Dark Ghost - wishes to create the Ultimate Eyecon and turn everyone on Earth into ghosts. Meanwhile, Makoto’s father Daigo Fukami is seen in the village. Transforming into Kamen Rider Zero Spectre, is Daigo an ally or an enemy? The fight for the Ultimate Eyecon begins. This is Takeru’s greatest ordeal. His moment of destiny is approaching! Argus (Ryo Kimura) was Emperor Adonis’s eldest son and Alain and Adel’s brother. Though deceased, he has become a ghost like Takeru. He transforms into Kamen Rider Dark Ghost. Daigo Fukami (Ikki Sawamura) is Makoto and Kanon’s father. They’ve finally reunited in the world where heroes’ souls can materialize. Where has he been since his children’s disappearance? He transforms into Kamen Rider Zero Spectre. Jared (Hiroyuki Yasojima of comedy duo 2700) is part of Argus’s guard. He transforms into Kamen Rider Dark Necrom (red). Jabilu (Tsuneishi of comedy duo 2700) is part of Argus’s guard. He transforms into Kamen Rider Dark Necrom (blue). Jay (Yuko Takayama) is part of Argus’s guard. She transforms into Kamen Rider Dark Necrom (yellow). Takayama previously portrayed Rinko Daimon in Kamen Rider Wizard."